I am not going to hide my joy. On my square, which could use a little gentrification (yes, I swear sometimes, it can be argued that it can be a good thing), a new café/bar just opened. It is a big industrial and airy space with a few plants hanging out the window and a bicycle hung on the wall. This place is not hiding its love for bicycles, in fact, you can grab your coffee and without even leaving the bar go shopping for your new tires at the bicycle store next door called Hot Point. The aim of this place is to become your next headquarters: the place you go to in the morning to grab a quick espresso while waiting for the bus 25 that will take you to work; the place you go back to after work for a cheap and tasty Spritz (only 9 CHF girls!) with your friends on a Monday evening to enjoy the last rays of the sun and to relax after a busy day at work; the place you go to on a Saturday afternoon alone to read this fascinating book you just started. The place you go to when you want to be home without being at home. I took my friends tonight and I will take my colleagues soon. 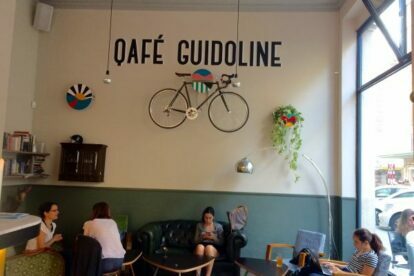 Qafé Guidoline, I promise I will be back for more!